Therapy at the Paley Institute Rehabilitation Dept. The Paley Institute is unique in that we have a fully-staffed, on-site rehabilitation department. For many of the lengthening and deformity corrections surgeries that Dr. Paley performs, rehabilitation is a critical component of treatment. 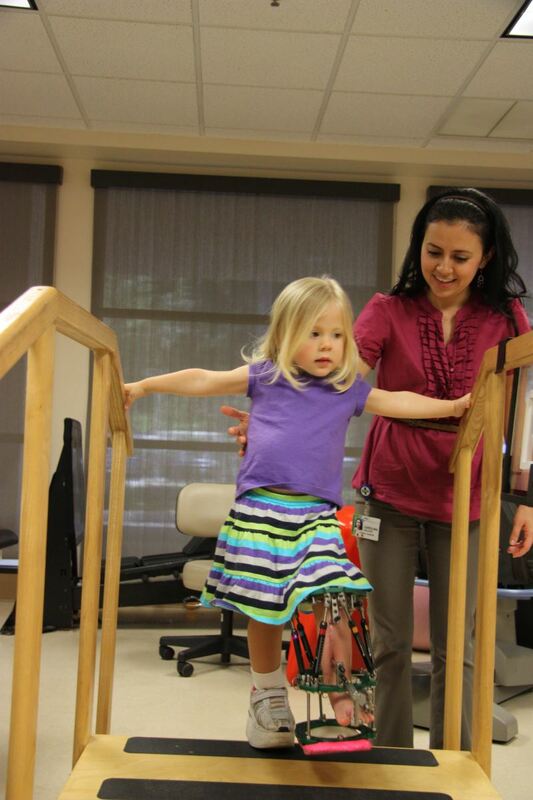 Having the rehabilitation department on-site offers a number of advantages for our patients. Dr. Paley and the physician assistants are always on-hand should any emergency arise. Furthermore, the physical therapists are in contact with Dr. Paley each and every day and can alert him to any potential complications as they arise. Since most patients receive therapy daily, the physical therapist is usually the first to spot a developing complication and can relay that to Dr. Paley so that it can be corrected swiftly. Having the rehabilitation department on-site also allows for coordinated care through every stage of treatment. The physicians, physician assistants, orthopedic technicians, physical therapists, and medical assistants are all in close proximity and can easily communicate with each other, allowing for a consistent, coordinated treatment strategy. All of the physical therapists at the Paley Rehabilitation Department have been specially trained to treat the rare and complex deformities that we see. Most physical therapists will never see a single external fixator or lengthening patient in their entire career; but the therapists at the Paley Rehabilitation Department see these patients every single day. Even for the rarest conditions, with birth rates as low as one in one million, it is not uncommon to encounter two or three of these patients at the Paley Rehabilitation Department at any one time. Each year, the Paley Rehabilitation Department sponsors a course on the rehabilitation of the lengthening patient. Therapists from all over the country and all over the globe come to this course in order to learn unique therapeutic treatment strategies from our therapists. For more information on the course, please see 2015 Rehabilitation Course. Therapy can be fun too! At the Paley Rehabilitation Department, we are committed to fostering a community. Patients travel from all over the world to receive treatment at the Paley Institute and they will spend a lot of time each day in physical therapy. Here, for the first time, many patients will meet other patients with the same diagnoses, going through the same experiences. Lifelong friendships have been forged here at the Paley Institute. Through programs like the NOVA Conference, the Paley Rehabilitation Department seeks to create a support network; helping each patient through the difficult rehabilitation process and helping each and every patient reach their ultimate goals.